Starring the voices of Seth McFarlane, Alex Borstein, Seth Green, Mila Kunis. 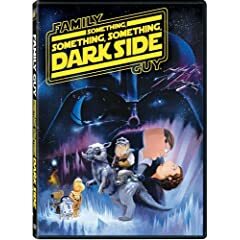 A direct-to-DVD sequel to Family Guy‘s Star Wars parody Blue Harvest, Something, Something, Something Dark Side follows, pokes fun at, and pays homage to The Empire Strikes Back. I don’t want to spoil any laughs, but much like the movie that inspired it, Blue Harvest was such a surprise hit that many fans (myself included) clamored for more. Though I own Blue Harvest, I avoided going back and watching it for comparison. Of course some of the newness has faded. I know the plot of Empire, I know Family Guy‘s irreverent style, but I laughed out loud several times watching Something, Something, Something on its own. Other fans may not have wanted Seth McFarlane and company to go the full Star Wars trilogy route, but now that it’s happened, those fans know they’ll be giving the sequels a look. DVD extras include a commentary with exec producers Seth McFarlane, Mark Hentmann, and David A. Goodman, writer Walter Kirker Butler, director Dominic Polcino, and actor Seth Green; pop-up trivia throughout the feature, a featurette on the movie’s poster art, a commentary with Dominic Polcino on the animated storyboards used to preview the movie, table read footage of the cast reading Acts 1 and 2, and a sneak peek at the table read for the concluding episode, We Have a Bad Feeling About This. The main feature is presented in 4:3 fullscreen ratio, but the menu screens and special features are widescreen. Subtitles are available in English, French, and Spanish.